Welcome to the website of Mutual Energy’s Gas businesses; Premier Transmission Limited (PTL), Belfast Gas Transmission Limited (BGTL) and West Transmission Limited (WTL) are key players in Northern Ireland’s energy industry, owning and managing the sub-sea Scotland/Northern Ireland gas pipeline (SNIP) through which all of the gas that is consumed in Northern Ireland flows as well as the main gas transmission pipeline bringing gas from Islandmagee to the Greater Belfast area and to the West of Northern Ireland. 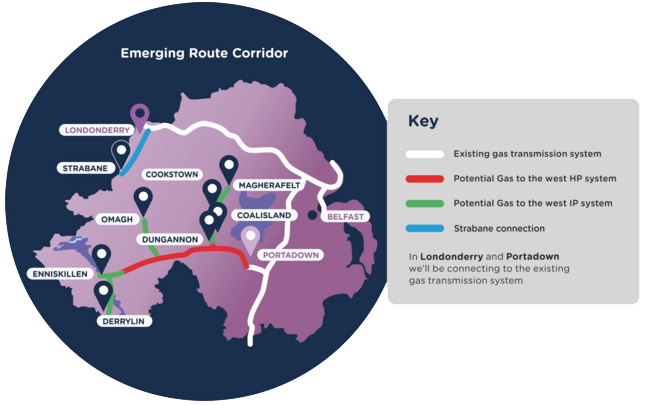 As a mutual company, all our activities are focused on the best interests of Northern Ireland’s energy consumers, and this publication is important in demonstrating the capability of the gas network to meet the ever growing needs of those consumers by providing an outlook for gas in Northern Ireland in the period ahead. 5. the West Transmission Pipeline (WTP) – owned by West Transmission Limited, part of Mutual Energy Limited, connects to the North West Pipeline at Maydown. Belfast Gas Transmission Limited (BGTL) is the owner of the Belfast Gas Transmission Pipeline system. Constructed over a period of three years between 1995 and 1998, the pipeline was completed to schedule and within budget. The pipeline also operates under an ‘open access’, non-discriminatory commercial framework.